It’s a phrase oft uttered when one friend introduces a new pal to an old one. A diplomatic way of saying “Don’t judge me based on the company I keep, we lived next door and shared a blankie when we were 5. Her crazy ways/lack of personality/nasty humor are no reflection on me.” You know, without actually having to come out and say it, because you’d never speak ill of your lifelong buddy, right? Maybe that’s why making friends as an adult is so much harder. Suddenly we’re in full control of who’s awarded our precious time. We’re not thrown into a relationship because our mothers are best friends or we grew up on the same block or we were randomly assigned a shared dorm room. Hectic schedules keep us from making plans with ladies who don’t fit our perceived BFF mold, because that would seem unproductive. A waste. But here’s the catch. The most satisfying friendships are often with people who are totally different from us. The very souls we could never see ourselves clicking with. They’re the ladies we couldn’t get rid of because our mothers were best friends or we lived on the same block or in the same dorm room. Since we couldn’t shake them, we learned to love them. What other choice did we have? I read recently that adults decide within 10 minutes of meeting someone what kind of relationship they want with that person. Once our grown-up minds are made up, we have a hard time changing them. Maybe if we did a bit more forcing, the people we meet who seem crazy or stand-offish or juvenile would in fact become the BFFs we’re (I’m?) looking for. 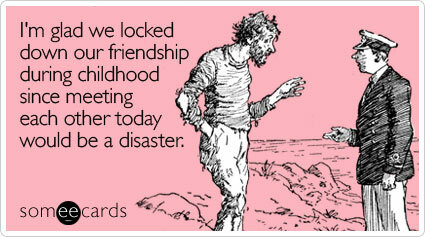 Or maybe meeting each other today would be a disaster. Thoughts? Do you have an old friend you don’t think you’d mesh with if you met today? Or is that a cop-out line? Is adult friending hard because we simply don’t give people a chance to grow on us? When it comes to overanalyzing, I am classic girl. I could—and do—dissect my personal dilemmas with anyone who will listen. I want to get everyone’s input, but also to voice my thoughts aloud, again and again, in hopes that a new solution might spout from my brain via my mouth. One of the primary reasons I want to find a new local BFF is to have a sounding board for some hard-core girl talk. It’s better for my marriage, and my sanity, to have a lady-friend to listen to me vent. Also, she can unload her baggage on me. As much as I enjoy scrutinizing my issues, I equally adore evaluating a friend’s. Turns out, though, that time with my new BFF could be better spent. Too much analysis will only lead to more emotional angst. Like when friends get together to complain about work or a mutual friend who’s getting on their nerves. When the bitchfest is over, you rarely feel better, just reinvigorated with whichever negative emotion you had to begin with. But there’s a better way! “With co-rumination, psychologists studying it say, one way for parents, and friends, to avoid the negative consequences is to focus on problem-solving, rather than on problem-dwelling.” In other words, instead of complaining to a friend about deadlines, I should be asking her advice on how to realistically meet them. One important point: This research does not mean you should stop opening up to pals. “The research distinguished between sharing or ‘self-disclosure,’ which is associated with positive friendships and positive feelings, and dwelling on problems, concerns, and frustrations.” Telling secrets? Yes. Never shutting up about how much you can’t stand an in-law? Probably not. Do you feel better or worse when you have a venting session with a friend?